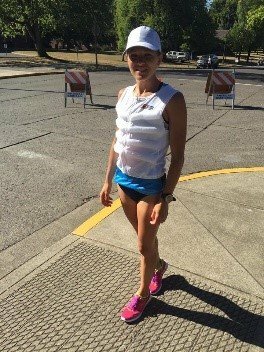 This blog post is brought to you Tara Welling, USA ½ Marathon National Champion and Running Coach with RunDoyen. For 1-1 Personal Coaching, Training Plans, Video Chat Consultations or to learn more about Tara, visit: RunDoyen.com/Tara. Become an Early Bird (or Night Owl)– The summertime is a great opportunity for running and many more people are out hitting the trails and roads. While the temperatures can rise quickly, wreaking havoc on training, it is best to develop a routine or habit for beating the hottest hours of the day. During the summer, the coolest hours of the day are pre-dawn before the sun rises, which is most optimal for running. Growing up in Arizona, I was acclimated to the heat; however, after living in the Pacific Northwest for the last five years my body is not used to the same conditions and I now set the alarm as early as 4:30 whenever I’m back home. Waking up early takes getting used to, but the predawn hours are very crisp and cool offering ideal conditions for a slow distance run or a workout. For all those night owls, I still encourage giving the 5:00 am wakeup call a try. If that’s not doable, consider pushing the run or workout until late in the evening, preferably after the sun sets. Temperatures will still be warm in the late evening and the trails/ roads will be much hotter but avoiding a run midday will have a more positive impact on training. With a late evening run, consider a pre-run meal that is easy on the stomach, especially if a workout is on the calendar. Plan Your Route– Before heading out for a run, plan a route that has shade, water fountains, and aim to stay off the asphalt or concrete if possible. Shade will help to keep the core body temperature cooler and seek out water fountains when possible to replenish lost fluid through sweat. Most parks and city walking paths have water fountains, but if running through town or neighborhoods don’t be hesitant to dip into a gas station or store and ask for a cup of water. In all my experience of running in the heat I have never come across anyone who denied me a cup of water during my run. In most cases, having a friendly smile and asking for a cup water brings a smile to their face followed by some comment such as, “Way to get out there! It’s hot outside! How are you running in that?” Stopping for a little water, air conditioning, and a smile from a stranger breaks up the run until the next water station. Lastly, aim to stay off concrete or asphalt and hit the dirt trails. As the day goes on the ground heats up and temperatures rise dramatically compared to running before the sun comes up. Every step on the concrete or asphalt later in the day passes through shoes and also makes body temperature rise. Trails tend to stay cooler and although it may not be possible to do the entire run on trail, so look for every opportunity when possible. Allow Your Body to Acclimatize– Running in the heat can be detrimental, but fortunately the body does adapt and repeated exposure to training in the heat will allow the body to acclimate. Plan ahead: if your next race is going to be warm, allow for 2-3 weeks of adapting to heat training. Heat training needs to be taken with caution, but if done correctly and safely your body will slowly adapt. Repeated exposure to sun and heat teaches the body to sweat sooner, which is the body’s natural cooling system. Not only does the body sweat sooner, but it retains more sodium in the body, rather than leaving through your sweat glands. Sodium is important for keeping cramps at bay and maintaining electrolytes in the system to prevent dehydration. Adjusting takes time, so start with running easy if doing heat acclimatization. Each runner is different, but around the two-week mark of exercising in the heat, the benefits of heat acclimatization begin to take place. Sweat efficiency, decreased heart rate and improved blood flow are a few benefits of heat acclimatization, which will positively impact racing in the heat and prevent dehydration or overheating. Adjust Your Paces- Easy distance runs and long runs may take more time to complete, compared to running in the cooler temperatures. For example, a routine six-mile route that typically takes 48 minutes to complete may take a few minutes longer simply due to the hotter temperatures. 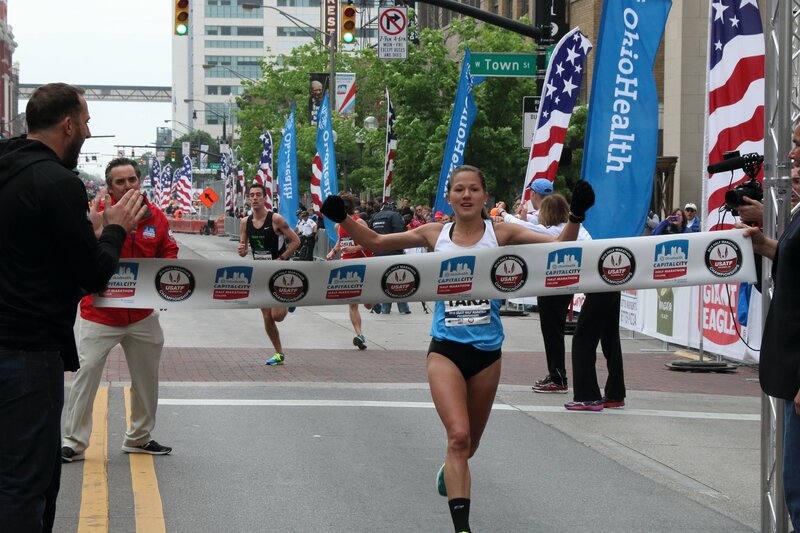 Adjusting pace and starting out slower will help prevent the body from overheating. Starting out too fast or running too fast inhibits the body from being able to cool itself and you may find yourself overheating, having to walk or cutting the run all together. Always err on the side of caution and start slower, gradually increasing pace if necessary. A good rule of thumb is to disregard what the GPS pace says, rather run by feel as that is the best indicator of knowing whether the pace should be slower. If you find yourself getting very hot, weak in the knees or light headed, that is a sure sign that the pace may be too quick. Same applies to workouts. 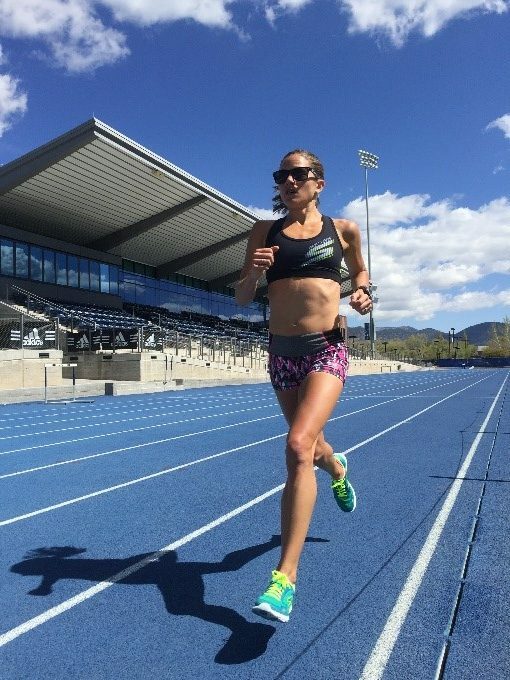 Speed intervals, tempos and long runs should all have adjusted paces for heat conditions. Speed intervals are generally easier to handle because the repetitions are shorter allowing for ample recovery. Tempos and long runs gradually raise the core body temperature without an opportunity for rest or cooling down. When doing these type of workouts, slow down the pace and always try to finish faster than started. Think of them as progressive, trying to get faster as the workout goes on. For tempos and longer runs, be sure to adjust your pace by approximately 1 second per mile for every degree over 80, and for interval workouts consider adding additional rest to allow time for your body to cool. Pre-Cool Your Body– Whether preparing for a run, workout or race be sure to hydrate with cold water and electrolytes. If going out for an easy distance run, consider lightweight clothing, and a hat and sunglasses to keep direct sun off your face and head. If possible, find shade and water along the route to stay cool. Workouts are much more taxing in the heat and it is better to be more prepared. Shorten your warmup when preparing for a workout. If a typical workout is 15-20 minutes, reduce it to 10 minutes. The warm temperatures will aid in warming up and loosening the muscles. Longer warmups risk overheating and are more likely to negatively impact the workout. Hydrate with cold or frozen beverages and utilize ice to cool your head, neck and core. Try planning workouts where you can pass by stored belongings. Pack a small ice chest with cold beverages, ice and hand towel. Having the ice towel handy after the warmup and laying the towel around your neck or on the head in between intervals will bring down the core body temperature very quickly. You will never get too cold being training in the heat, so be extra prepared and pack accordingly!